I had the chance to play with the Garmin Nuvi 880 during our recent trip to Wildwood, New Jersey. I have to say this is one drool worthy gadget. The Garmin Nuvi 880 is a sleek, thin and portable GPS. It only weighs 6.2 oz and is only .7 inch thin. Very easy to transfer it from one vehicle to another. You also get a pure, unadulterated 4.3 inch touch screen. What I mean by unadulterated is that there's no buttons on the front. The touch screen itself is responsive and the interface is user friendly. 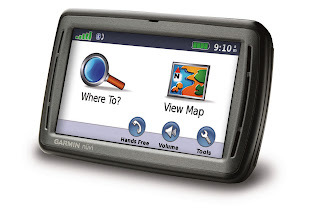 The Garmin Nuvi 880 comes with the City Navigator NT maps. We were trying to figure out some things to do in New Jersey and it's a good thing that the maps have a lot of points of Interests and we easily found some Wildwood hotels. Since my friend's Garmin Nuvi 880 is only a month old, we were able to make use of the free 3 month MSN Direct services so we got up to date traffic updates and local movie schedules. Another cool feature on the Garmin Nuvi 880 is its speech recognition software. Now I rarely use speech recognition on any gadgets because they always turn out like crap and besides, I have an accent so 3 out of 10 times, the software usually doesn't recognize what I'm saying. However, I was farely impressed with the speech recognition on the Garmin Nuvi 880. My friends and I had fun taking turns shouting at the Garmin Nuvi 880. As for the GPS antennae on this device, it's pretty fast and accurate and takes only a few seconds to lock on our position. As for the route calculation, I can't really say if it's accurate or not since we were threading on an unfamiliar territory so we had no way of knowing if we really are taking the shortest way to our destination. Though I love to get my hands on the Garmin Nuvi 880, at $999.99 it's still pretty expensive for me specially for a GPS. But I guess quality does come at a price because the Nuvi 880's performance is excellent--at least on my book.